Glycogen matters. Having chronic full glycogen stores, while continuing to consume ample amounts of carbohydrates, is a bad idea, especially if your fat tissue does not easily expand. Glycogen is a treat the body gives us when we need extra and fast energy. Even on a low carb diet we never fully deplete our glycogen stores (skeletal muscle and liver) and high intensity exercise on a low carb diet still makes you dig into your glycogen stores. But what if you were all out of glycogen and tried to exercise? There are in fact people who are unable to use glycogen during exercise. Some of these people lack myophosphorylase, an enzyme that breaks glycogen down to glucose-1-phosphate. These people have what is known as glycogen storage disease type V, commonly called McArdle’s disease. The disease was recognized by Dr. Brian McArdle who first noticed it when he came across a patient who experienced pain and weakness after exercise. McArdle did an exercise test on the patient and noticed that he failed to increase lactate levels. This prompted him to believe that the patient had a glycogen breakdown problem. If you are one of the 1:100 000 who has McArdle’s, proper warm up is very important. Gradual warm up causes a gradual increase in fat metabolism which reduces the need for glycogen. This is also a tip to everyone on ketogenic diets who like to engage in vigorous exercise. Proper and gradually increasing warm up exercises makes sure as much fat as possible is ready for use. Patients with McArdle’s are known to experience a “second wind” which happens when alternative sources of energy are increasing in availability. Keeping muscle glycogen stores from being full is perhaps one of the most important strategies when it comes to treating insulin resistance. Once glycogen stores are full, the muscles become insulin resistant, to keep from getting “sugar poisoned.” When glycogen stores are low, muscles increase the uptake of glucose from the blood by increasing the glucose transporter GLUT4 in the cellular membrane. This protects us from high blood sugar. In patients with McArdle’s, due to their inability to convert glycogen to glucose-1-phosphate, the muscles increase GLUT4 in order to get enough fuel . But in McArdle’s the glycogen stores are full, and so they have impaired glucose tolerance and are in fact insulin resistant, despite increased GLUT4 . One of the problems with not being able to break down glycogen is that the body must burn alternative fuels. These fuels are proteins or fats. For those of you reasonably versed in physiology you probably see how this can be problematic. On a high carbohydrate diet and little or no ability to break down glycogen, protein breakdown will be high. As the body breaks down proteins to glucose, the McArdle’s patients experience muscle wasting and renal failure due to myoglobinuria (muscle form of hemoglobin in the urine). There is more to learn from these strange myopathies. For one, it is postulated that the exercise induced growth hormone (GH) response is stimulated by lactate. Lactate is produced when the muscles break down glycogen. Thus, exercising patients with McArdle’s disease should provide a clue. This was the reasoning of a research group from the UK . They exercised 11 patients with McArdle’s and found that lactate remained at a resting level throughout the exercise and 9 of the 11 patients failed to show a significant exercise induced increase in growth hormone. Thus, it seems likely that lactate really is an important growth hormone stimulus. If you are interested in a large GH response, high intensity does it. Although circulating levels of GH rise in response to low intensity exercise, a sevenfold and sustained rise (60–90 min post-exercise) in GH is observed with exercise above the lactate threshold. McArdle’s patients easily become sedentary. This just serves to exacerbate muscle breakdown and worsen muscular quality. But you don’t need glycogen to exercise or build muscles. 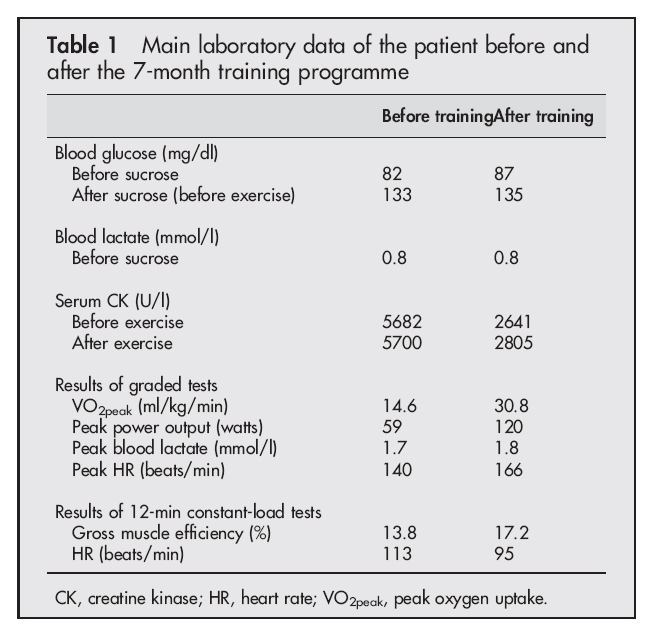 Simple running has proven very effective in one case report . Running also involves eccentric exercise which has a low energy cost for a given level of muscle force. Although a ketogenic diet seems the natural choice for patients with McArdle’s, there are no real good studies of the strategy. A few small studies have examined high protein feeding with some very modest results , but high protein seems a bit of, as fat and ketones can replace glycogen more easily than proteins. Other strategies such as supplementing with creatine or vitamin B6 or ingesting glucose prior to exercise has been tested, but with varying results. 1. Robertshaw HA, Raha S, Kaczor JJ, Tarnopolsky MA: Increased PFK activity and GLUT4 protein content in McArdle’s disease. Muscle Nerve 2008, 37: 431-437. 2. Nielsen JN, Vissing J, Wojtaszewski JF, Haller RG, Begum N, Richter EA: Decreased insulin action in skeletal muscle from patients with McArdle’s disease. Am J Physiol Endocrinol Metab 2002, 282: E1267-E1275. 3. Godfrey RJ, Whyte GP, Buckley J, Quinlivan R: The role of lactate in the exercise-induced human growth hormone response: evidence from McArdle disease. Br J Sports Med 2009, 43: 521-525. 4. Vorgerd M, Zange J: Treatment of glycogenosys type V (McArdle disease) with creatine and ketogenic diet with clinical scores and with 31P-MRS on working leg muscle. Acta Myol 2007, 26: 61-63. 5. Busch V, Gempel K, Hack A, Muller K, Vorgerd M, Lochmuller H, Baumeister FA: Treatment of glycogenosis type V with ketogenic diet. Ann Neurol 2005, 58: 341. 6. Viskoper RJ, Wolf E, Chaco J, Katz R, Chowers I: McArdle’s syndrome: the reaction to a fat-rich diet. Am J Med Sci 1975, 269: 217-221. 7. Perez M, Moran M, Cardona C, Mate-Munoz JL, Rubio JC, Andreu AL, Martin MA, Arenas J, Lucia A: Can patients with McArdle’s disease run? Br J Sports Med 2007, 41: 53-54. 8. Quinlivan R, Beynon RJ: Pharmacological and nutritional treatment for McArdle’s disease (Glycogen Storage Disease type V). Cochrane Database Syst Rev 2004, CD003458. Great post Pål! I think the term is “myoglobinuria”, with an “i”before the “a” at the end. Do those with McArdle's disease have problems with short sprints or high intensity lifts, or does phosphocreatine system handle that? What about normal sprinters or weightlifters on a low carb diet–should they be concerned? John: They can sprint, but not for long. Small dose creatine supplementing increases exercise tolerance and they are more dependent on creatinephosphate than the rest of us.I have't seen any data on lifting. The problem is that they would need long rests between lifts or sprints, making it rather ineffective. Normal weightlifters or sprinters on low carb should not be concerned. Andrew: I'm always happy for any clarifications and suggestions for changes. E-mail me at jabekk@gmail.com. Great blog, by the way. I'm currently reading through older posts. I'm a bit pressed for time right now, but the “increase in blood flow causes increased delivery of fat” is one of those physiology textbook common knowledge thingies which is so accepted that it is rarely given a reference. Increased adipose tissue blood flow increases delivery of NEFA to energy needing tissues. If you hit pubmed and type in something like “blood flow lipolysis exercise” you should find several good and available references. Hi, I know I'm late to the party, but I wanted to say I have McArdle's disease, and I really enjoyed this article. Thanks! Thank you Pål, you're 100% right! My daughter is 11 years old and has McArdle's disease. We live in Stockholm and she's helped by the ketoteam of Astrid Lindgren Barnsjukhuset. I put her on ketogenic diet under my full responsibility because the protocol for this disease is a crazy high carbohydrates and sugary drinks diet. I'm sorry that you are in Oslo because it would be great if you could help me training my daughter. I forgot to tell you that during the 7 months on the sugar diet she ended on a wheelchair and was completely letargic. Now she's not overweight and can walk. Thank you again for spreading good information. That is such a great story Barbara and I am super happy that you've found help at Astrid Lindgrens. Hope your daughter keeps doing well on her new diet. Good luck and thanks for sharing! My wife has McArdles its like a diabetic some people say disease well i haven't caught it yet or our kids. dan b. from saskatoon sk. That I am unsure of Robert. I have not heard of any one with McArdles taking metformin and I am not sure how and why that would help. Keeping insulin levels under control is vital to stimulate HGH production. You can try intense workouts and fasting because these will help you lose weight and they feature among the best ways to boost your HGH levels naturally. Forrige Forrige innlegg: Mindre fett?